Public investment, and particularly infrastructure investment, is important for sustainable economic growth and development as well as public service provision. However, it is also vulnerable to capture and corruption. This publication examines the direct and indirect benefits of public investment if carried out in a clean and efficient manner. It provides a Framework for Integrity in Public Investment, mapping out risks of corruption at each phase of the investment cycle. 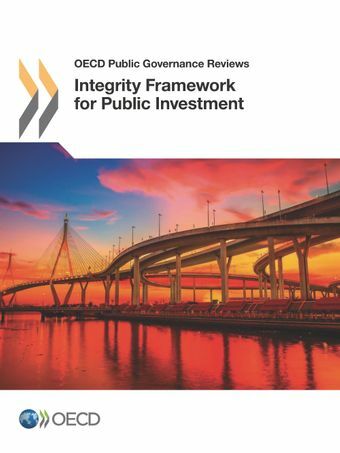 It also identifies tools and mechanisms to promote integrity in the public investment cycle and provides examples of their successful implementation in both the public and private sectors. The Framework was initially discussed during the 2015 OECD Integrity Forum, and has benefited from an open consultation with stakeholders. It includes concrete measures and mechanisms that can be employed at each phase of the public investment cycle in order to safeguard integrity. Examples of good implementation practices from both the public and private sectors are provided for consideration and inspiration.